With the Droid DNA becoming the first US phone to have a 1080p display, it seems the race is on for the next valiant manufacturer to build a similar or better display to outmatch HTC and Verizon’s baby. 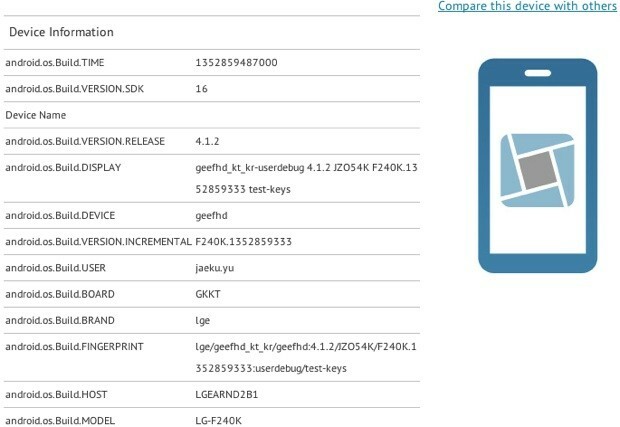 The leak, fromGLBenchmark, shows a device named the LG F240 that has a 1080p display. The LG Optimus G was the top Android display, for a few weeks, then Verizon and HTC rolled out their Droid DNA, a giant 5-inch smartphone with an impressive design and display. We have already said that the HTC Droid DNA beats every single smartphone on the market in terms of display by a massive 100ppi. According to the leak, the LG F240 will have 1080p display and a quad-core 1.5GHz Snapdragon S4 Pro processor, the same as the Droid DNA does. Additionally, the LG F240 has an Adreno 320 GPU to smooth gaming and graphics along. We are uncertain what the RAM specs are. While LG have just released the Google Nexus 4 device too, it seems they really want to stay on top and bring a new device to market. We are unsure about the LG F240, but we believe that we are bound to see more devices with 1080p displays come out in the coming months. Android 4.1.2 will be the operating system on the LG F240, which brings us to suspect that this isn’t going to take a long time to come out. We suspect that the LG F240, if real, is already in preparation to go out to various markets around the world. If this phone was set for mid-2013, it would come with Android 4.2 pre-installed – this is the path we’ve seen LG, Samsung and HTC take on a lot of their devices. This brings us to think that LG are preparing the LG F240 for Christmas or spring-2013.